Today was one of those days I wish the principal could come in and observe all the time. It started with passing back their first test. I am still not putting grades on their assessments, like in this video from Ashli Black. I write lots of feedback and then a note on the top of their test of what they did well and what they could still work on. The kids are still asking how many points I took off for each thing, but I did hear a couple good conversations between students about the problems. Next time, I may do something more like this (from Emily Steinmetz) to get the students reengaged in their work. I then got into parallel lines cut by transversals. To explain interior and exterior, I talk about how the two parallel (or not parallel) lines are like the edges of a river and the transversal is like a bridge going over the river. This helps some students see more of why the angle pairs are named that way. I went through a few examples on paper but then I moved to giving out painters tape. 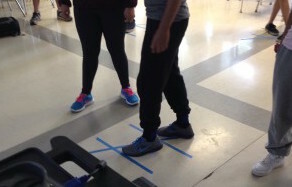 We were gearing up for Dance Dance Transversal, but first had them do a little angle pair identification with a partner. I had them help me move all the desks out of the way, gave all of them three pieces of painters tape, and told them to make their two parallel lines and transversal. I modeled what I wanted it to sort of look like in terms of size, and because it was painters tape I could ask students to make theirs bigger or smaller really easily. 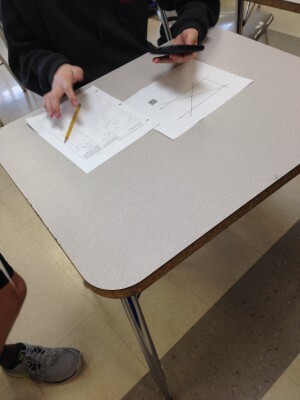 So first I told them that they were going to work with a partner to identify the angle pairs that I give them. I shouted out a bunch of angle pairs one at a time – I even threw in vertical, supplementary, and adjacent. 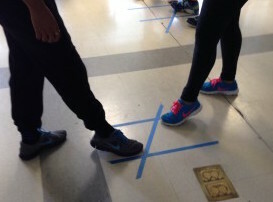 After I shouted the name, each student had to put on foot on an angle and between the partners they should have been showing me the angle pair correctly. 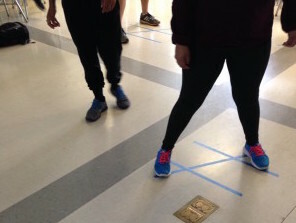 It was pretty fun already because the students would start with their foot in one place but then the other partner would change or they would both change and have to decide on where they want to go. I wouldn’t move on until all the groups had it correct. Luckily my summer school class is only 17 kids so it was easy to scan the 8 groups (one group of three) to see if they were correct. Then we got into the real fun. Dance Dance Transversal. I had seen it from Julie, Kate, and Jessica. I was so excited to try it out in class and had told the kids the day before to be ready to dance the next day. That definitely got the kids a little curious. And I liked the PowerPoints that I saw out there, but I needed to adjust them a little. A little aside about my brother now – he’s been playing DDR or ITG for years now. We have a mat in our house and he frequently goes to the dancing competitions. He’s one of the intense ones that actually uses that bar behind him and everything. So even though what I saw out there was fine, I had to live up to my DDR playing brother’s expectations and really have it look like the real thing. I also wanted to add in vertical angles since I have felt like in the past my students have always forgotten about those. I did my best with this PowerPoint: Dance Dance Transversal. Each round will last about 90 seconds. I added in a practice round because I had comments from class that it started too fast. The words are covered by a box on the bottom of the slide and you can adjust how fast they go or how many their are by looking at the animations (or transitions depending on your PowerPoint version) and adjusting the timing. I know there is a way to have audio start playing when you advance to another slide but my personal computer that I use in summer school does not consistently have working sound, so I just played music off of my phone. I used Shake It Off by Taylor Swift, Rude by Magic, Magic by B.o.B. and Rivers Cuomo, Locked Out of Heaven by Bruno Mars, Shut Up & Dance by Walk the Moon, Want to Want Me by Jason Derulo, and the first few seconds of Honey, I’m Good by Andy Grammer. I didn’t expect to go too far into the lightning rounds and the kids agreed – it was too fast. I will admit, it is very hard to find songs that actually will line up. You need to have songs play at the exact right time and the bpm should be 96 for 5 second transitions, 160 for 3 seconds, 240 for 2 seconds, and 480 for 1 second, or some multiple/factor of that. The timing didn’t really get to my students, though. I also tried out this QR Code Scavenger Hunt that I got from Shelley Carranza. Best comment from a student was “I love that you don’t expect us to just sit at our desks for four hours.” I loved the worksheet that Shelly provided because it required students to really think more about the problem even after they found the right one from the clues. J’aime bien quand je trouve les activités extraordinaire qui forcent les étudiants à bouger.